On July 14, 2000, President Bill Clinton signed into law the Valles Caldera Preservation Act, a visionary piece of legislation establishing the process by which an 89,000-acre tract of privately owned ranch land in northern New Mexico's Jemez Mountains would be transferred to the federal government and managed for public use. The Valles Caldera had already been the focus of intense public interest for decades for good reason: it is a land of superlatives. In beauty, productivity, ecological and geological significance, scientific interest, cultural importance, and in its sheer magnificence it is a landscape of the first rank. Water as well as fire shaped the present region. Its singularity began with the geological events that unfolded some 1.22 million years ago when the area became the scene of violent volcanic activity and the subsequent formation of a giant caldera, or collapsed volcanic field, in the present Jemez Mountains. Later eruptions of a less explosive nature, as well as the erosive force of water, have continued to shape the landscape. Today the massive volcanic powers beneath the caldera are dormant but not extinct. 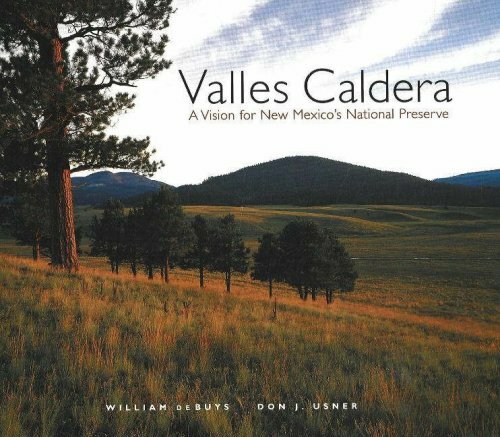 Valles Caldera: A Vision for New Mexico's National Preserve tells the natural and human history of the preserve and presents photographs of the awesome splendor of its valleys and mountains, mixed-conifer forests, grasslands, streams and geothermal springs, and species diversity. Of significance to all who recognized the precious importance of the preserve, it tells the story of the unique administrative experiment now underway to manage its public lands.